Spiniello is an industry leader in the construction and rehabilitation of underground pipelines. For more than 95 years, we have transformed the world's infrastructure with our heavy construction and water and sewer utilities expertise. We are known for completing projects on time — and on budget. Spiniello focuses on making every project as safe, efficient and economical as possible. We have a long history of innovation — of applying the latest technologies, construction methods and safety practices within our operations. Find out why we're the best choice for your pipeline project. Corrosion and buildup are some of the most common problems plaguing water infrastructure across the nation. These problems result in leakages, poor water flow and greater pumping expenses. Spiniello offers Cement Mortar Lining (CML) services to help extend the life of pipes in great need of repairs. The CML process has been used in various incarnations since the 1840s, and has now been perfected to allow cement mixtures to be easily and efficiently applied to pipes to strengthen pipe linings and reduce permeability, making it a great alternative to a full pipe replacement. How do Spiniello’s CML solutions work? The Spiniello reinforced CML process involves applying layers of lining with reinforced steel rods. This allows our team to rehabilitate pipes with much larger diameters (30 inches in diameter and larger) with high test pressures. By using this process we are able to eliminate interior corrosion because of the high pH zones created by the CML. These zones act as a chemical shield, preventing the buildup of rust. CML also increases the carrying capacity of pipes, restoring and maintaining high levels of flow capacity for years to come. What are the benefits of Spiniello’s CML solutions? Savings. With Spiniello’s centrifugally applied lining, clients get the performance of a brand new pipeline at a tiny percentage of the cost of a replacement. Operational costs are also lower because of the lasting interior protection applied to these pipes. Versatility. By using our specialized equipment, we are able to restore almost any pipe, including steel, cast iron, brick, concrete, asbestos-cement, wood stave or corrugated metal. We can apply these solutions to pipes of all sizes, from four inches to 22 feet or more. Ease. Rather than having to deal with the logistical nightmare of digging up and replacing pipes, CML solutions allow you to leave existing pipes in place. Place your trust in a team with more than 50 years of experience in rehabilitating pipelines. Contact us today for more information about the services we provide. Many of our country’s sewer and water systems are starting to degrade because of their age. They are becoming corroded, structurally unstable and ill-equipped to meet the growing demands for flow capacity. However, digging up pipes and replacing them is an unrealistic option considering the budgetary impact and logistical complexities associated with such a project. Over the last few decades, many municipalities have adopted “trenchless” pipelining solutions like Cured-in-Place Pipe (CIPP) as a more affordable and efficient solution for replacing aging pipes. CIPP lining can be performed to rehabilitate nearly any type of pipe, including cast iron, clay, PVC, concrete, corrugated metal and more. The result: sturdier pipes and more reliable sewer and water main repair without having to excavate existing infrastructure. How do Spiniello’s CIPP solutions work? Installing CIPP lining solutions is a relatively simple process. Our team inserts a resin-impregnated liner within the host pipe, inverts the liner and then heat-cures it to form the same rigid shape as the original pipe. These solutions work for pipes of all shapes and sizes. We are able to rehabilitate water, sewer and industrial process pipes ranging from 4” to 120” in diameter. These pipes can be oval, horseshoe or egg-shaped. What are the benefits of CIPP solutions from Spiniello? Less stress. The CIPP process takes far less time, costs less money and has a significantly smaller environmental impact than excavation. Less disruption. CIPP comes with fewer traffic disruptions and interference with utility services. Less corrosion. Corrosion on pipes eventually causes them to become blocked and leaky, but CIPP lining prevents that corrosion from forming. Better performance. CIPP improves the flow capacity and overall durability of pipes. Long-term protection. Installing systems of pipes is a significant investment, and repairing them with CIPP maximizes the long-term value of that investment. Spiniello has more than 50 years of experience in rehabilitating pipelines. Place your trust in our team. Contact us today for more information about our CIPP solutions. Sliplining might just be the oldest of all the trenchless pipe rehabilitation techniques, but it remains one of the most popular to this day because of its ease and effectiveness. With this technique, a new, smaller pipe is inserted inside a deteriorated pipe to extend the life of important water infrastructure. Spiniello has completed a wide variety of sliplining projects, including sanitary sewer mains, potable water, industrial pipelines, wastewater collection systems and more. Let us work with you to restore your pipes to proper working condition. How do Spiniello’s sliplining services work? Any new pipes used in sliplining obviously need to be smaller than the host pipe. The new pipe is first laid out above ground, then pulled through an excavated area into the host pipe. The new pipe then gets winched to manhole or exit pit through the host pipe. Materials for new pipes can include polyvinyl chloride (PVC), polyurethane (HDPE and HE) and more. Once the pipe is in place, the space between the new and host pipes needs to be sealed. Spiniello uses a special water-tight sealing solution to ensure no leakage gets through to damage the new pipe. What are the benefits of sliplining? Efficiency. You are able to save a significant amount of money and time while providing an environmentally friendly pipe rehabilitation solution. Logistically friendly. Because there isn’t nearly as much excavation required with sliplining as regular pipe replacement, you can drastically minimize the disruptions for pedestrians and vehicles. Better performance. Sliplining enables you to improve the flow characteristics of sewer and water lines, remove risks of corrosion and leakage and reduce the costs of pumping and ongoing maintenance. Our team has more than 50 years of experience in rehabilitating pipes. Place your trust in our experts and call us today for more information about how we can assist you in your job. Spiniello made its name in quality heavy construction. Our first such project came more than 85 years ago, and to this day we continue to lead the industry by bringing talented people, state-of-the-art technologies and specialized equipment into every project. Marine Outfalls in Puerto Rico. Before the outfalls for four cities in Puerto Rico could be constructed, a temporary marine processing facility needed to be relocated. The Spiniello team devised a unique combination of barges, tug boats, cranes, winches and anchors to orchestrate the move. The project was completed without a hitch. The largest potable water infrastructure in the Bahamas. The city of Nassau in the Bahamas needed to get drinking water from two distant wells located at either end of the island. Spiniello ran 180,000LF of PVC piping spanning 6” to 20” to develop the largest potable water infrastructure in the Bahamas. Beyond the piping installation, the project also included thousands of service lines, hydrants and various types of valves. Massive pipeline project in Oklahoma. As a real test of endurance, Spiniello helped the United States Bureau of Reclamation run 26 miles of 66” and 72” welded steel pipe in Atoka, OK.
Water pollution abatement in Connecticut. For this multifaceted project in New Haven, CT, Spiniello needed to subaqueously place twin 48” ductile iron sewer force mains, as well as a standalone 48” pipe. The three mains had a combined length of 11,000LF and were supported by 25,000LF of pipes, which were driven on land and into the river bed. We then built a new high-capacity wastewater pumping station, an integral part of a system that serves 200,000 people. Spiniello is the industry’s most trusted name for heavy construction, a reputation built on 85-plus years of quality. Contact our team today for more information about how we can help you accomplish your project. 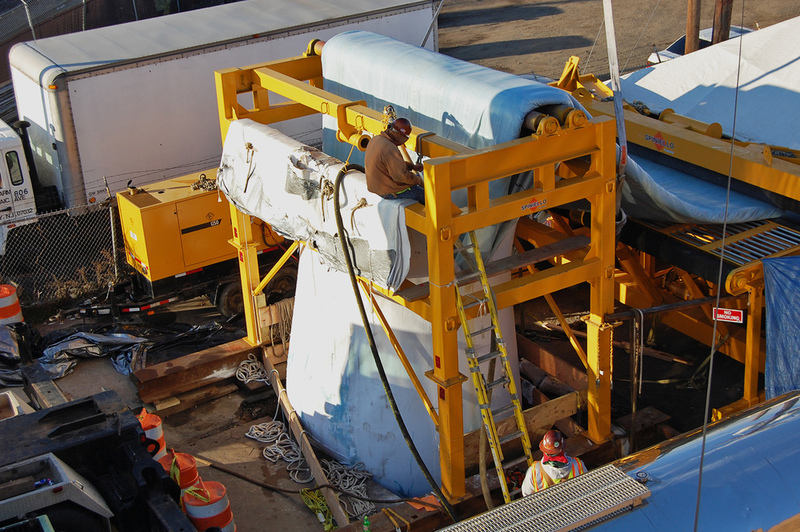 Bypass pumping is an important part of the pipe rehabilitation process. Teams working on pipe rehabilitation install temporary bypass pumping systems to transfer sewage and water flow, which helps to maintain uninterrupted services for local businesses and residents while maintenance work is occurring. Spiniello has decades of experience in high volume flow in both residential water and sewage bypass. Our team manages every aspect of bypass pumping, including engineering, installation, pressure testing and operations. We also have all of the equipment needed to set up high-quality bypass pumping systems, including submersible pumps, dry-priming pumps, pipes, fittings and all other necessary equipment. Spiniello recently completed a project in Baltimore County, Maryland, the Patapsco Interceptor and Relief Sewer Rehabilitation Project, using an in-house bypass and bypassing flows of 80 MGD for more than one year. We are currently beginning a new project requiring the bypass of 120 MGD. Clearly, we are able to handle projects of all sizes and types thanks to our bypass pumping expertise. Expertise. Our decades of experience and in-house expertise allow us to control projects from the beginning through completion. Logistically friendly. Our bypass pumping services allow residential and commercial neighborhoods to continue using their services without interruption. Affordability. We provide competitive pricing and high-quality for our bypass pumping solutions. Spiniello has decades of experience in both bypass pumping and pipe rehabilitation. Contact us today to learn more about how our services can be of use to you in your next project. Pipe bursting is a form of trenchless pipe replacement allowing for easier replacement of water and sewer pipes. It is a relatively new form of pipe replacement, gaining popularity over the last few decades. It was initially developed to replace small-diameter cast-iron lines for gas distribution, but now it has become an effective means of replacing pipes of all materials, sizes and functions. Spiniello is pleased to offer pipe bursting services backed by decades of experience. These solutions increase the flow characteristics and diameter of your underground pipelines while minimizing disturbances above ground. Specially designed bladed rollers get pulled through an existing line of pipes by a hydraulically powered bursting unit. As the bladed rollers are pulled through the host pipe they split it apart. An expander attached to the rollers then forces the fragmented pipe into the surrounding soil, while simultaneously pulling in the new pipe. Minimized disturbances. Like other trenchless pipe replacing and rehabilitating services, pipe bursting comes with minimized above-ground disturbances, meaning pedestrians and drivers won’t have nearly as many delays or inconveniences. Affordable. Pipe bursting is a much more affordable alternative to traditional construction trench pipe replacement. You save money on both equipment and labor. Flexible. Pipe bursting is an option for pipes of all sizes and materials. The team at Spiniello has more than 50 years of experience in the field of pipe replacement. Contact us today to learn more about why pipe bursting might be the best option for your project.